I have recently acquired a 32GB iPod touch to be investigated mainly for its use in a higher education context. I intend in this occasional series to reflect on the various features and applications that I have found to be useful. By implication these applications this will also apply to the iPhone but the plan is to talk about features that apply to both. 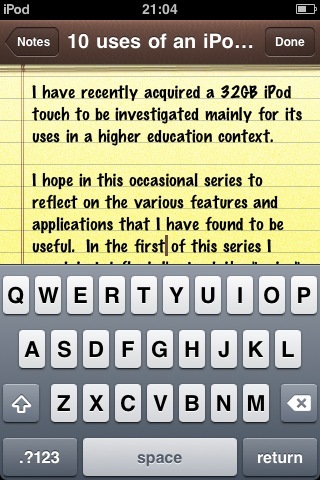 In the first of this series I want to briefly mention the “notes” application which comes as standard on the iPod touch. I have found this feature to be most useful; in fact I am using it to write these reflections during a quiet moment in an examination board session as I wait for another course to be considered! Do these things ever run to time?! Admittedly it is unlikely you will write a book chapter using this app but to capture ideas or make a quick note to yourself, it then comes into its own. In a teaching and learning context notes could be used to make rapid feedback during practical classes or at presentations where background noise or the very disruptive nature of doing so might preclude recording audio feedback. The beauty of this app lies again in the handiness of the iPod technology which is much more portable and more readily coaxed from standby mode than even the most agile laptop PC or netbook. Notes captured on this app may be emailed either to a group for feedback or to your own email account for use in other applications. My uses or suggested uses are given in the list below. Notes during conference lectures if you are not tweeting! Of course there are also situations where students could use these devices to record their reflections or for learning purposes. If readers are using Notes for other things in an education context, please add these as a comment below. This entry was posted in Quick Reflections, Technology in Education and tagged higher education, iphone, ipod, ipod touch, notes, technology. Bookmark the permalink.